Went to Japantown last weekend and picked up a buncha books. 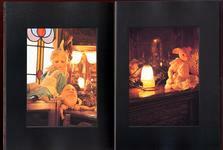 Among the Dolly Dolly & the Ayumi Uyama “Vintage Pose Doll” books (eeeeeeeee!) Mr. Kallisti found “Alice in the Twins World.” A slender volume attractively covered in black paper with a cut-out revealing the twins beneath. Just pictures of romantically, fantastically clad art ball-joint dolls. Gorgeous. Local Dungeness Crab season opened this week, so I think we’re gonna go try and find us someone to cook us whole crab tonight. YUM. And then Godzilla Fest tomorrow night at the Castro for Mothra, and flea market on sunday! Um, I thought I was supposed to be resting. D’oh. You don’t get much cuter than that. Taken in September when my Mother-in-law was visiting. Happy.